Leeks are intricately connected to Christmas-time for me. Growing up we ate them only once a year, but always on Christmas Eve when my mother made them into Potato Leek Soup. I realized there were many more delicious ways to use leeks when we lived in Scotland. 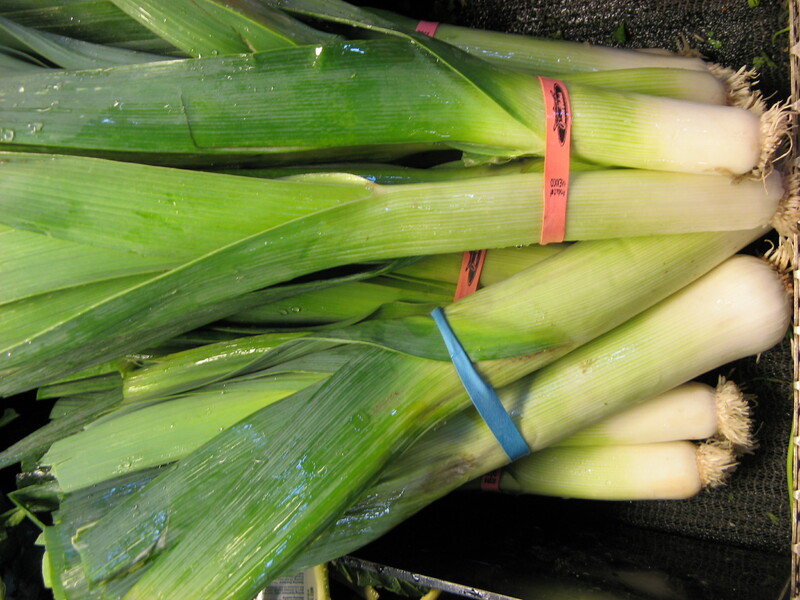 There leeks are plentiful and commonly used for such things as soup, gratins, and side dishes. Similar in taste to an onion, but milder, leeks lend a lovely, savory taste to whatever dish they are added to. Leeks come in a long, cylinder shape and need to be washed well before use. The easiest way to prepare leeks is to cut the very bottom off and begin slicing in thin rounds up through the white part and just into the green part. Separate the slices into little rings and gently wash. I use a salad spinner to wash and then spin dry the leek circles. If I don't need a whole bunch of leeks at once, I freeze the extra on a baking sheet covered in parchment paper, removing them to a heavy plastic bag once frozen. 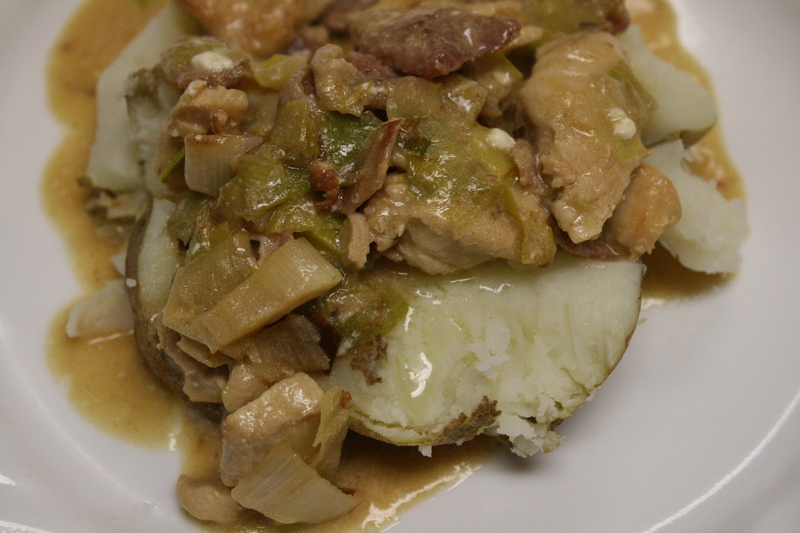 This week I have a great-tasting, easy recipe for using leeks: Creamy Chicken and Leeks served over a baked potato. It cooks up quickly and can be served with a salad alongside. For those of you interested in trying other leek recipes, let me suggest Alaina's Potato Leek Soup, or this Creamy Baked Leeks with Citrus Crumbs, or perhaps just Buttered Leeks. Heat the oil in a large sauce pan and fry the bacon for 2 minutes. Add the chicken, then cook with the bacon for a further 2-3 minutes, until the pieces begin to turn golden. Tip in the leeks and cook gently for 10 minutes until leeks are wilted and tender. Stir through the flour and gradually add the stock, stirring constantly. Add the grainy mustard and sour-cream, stir again, then simmer gently for 5 minutes until the sauce is slightly thickened and creamy. Serve on top of baked potatoes. MMMM!! I love leeks! 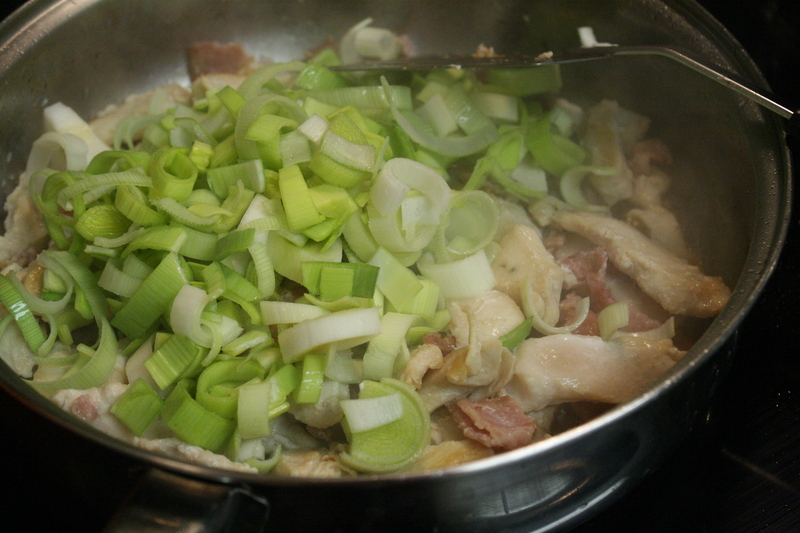 I boil them till tender(chopped leeks...1 cm pieces), drain them. Then, put them back in the pan...add butter, salt, pepper, some capfuls of vinegar, then thicken it with corstarch and sometimes milk. Basically, it is creamed leeks! So you throw away the rest of the green part? Or is there something you can do with it? I use about half of the green part -- the lighter green part. Otherwise I throw the rest away, although I think they could be tasty in a stock (of course you strain them out of the stock before you use it).